Often in cities it is the small things that catch the eye, and the small details the create a stimulating streetscape that one can return to again and again with boredom. Sure, shop signs and windows displays are the main attraction, but often those ever-changing contemproary details are set in fixed architectural frames. 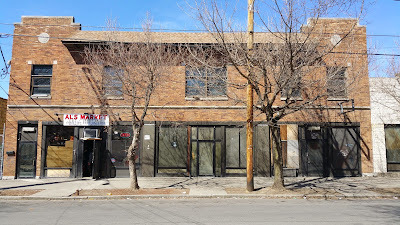 I've posted often about Art Deco period and style building in Syracuse. Most of those buildings wanted to stand out - not just fit in. 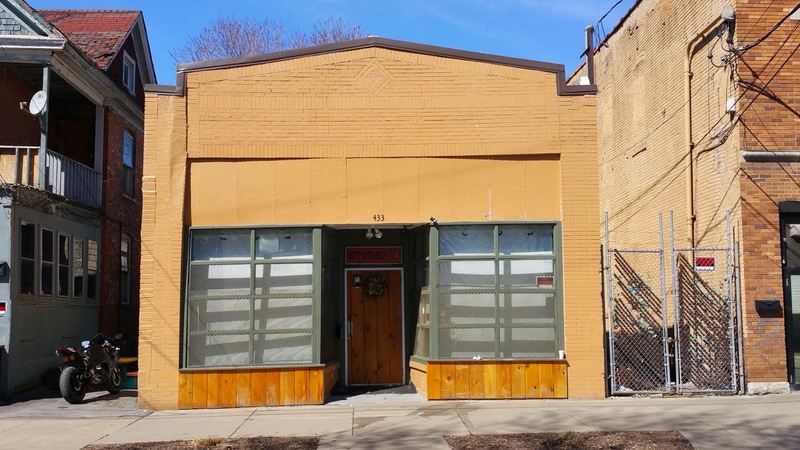 But one of the best legacies of the commercial building boom of the 1920s is the large number of simple vernacular commercial buildings that rise above the ordinary because they were a bit of thought and a bit of simple desecration. These buildings are scattered around the city, but they were most often found clustered on busy thoroughfares, often on trolley lines. They are an urban version of the early strip mall which began to develop in the interwar period on local highways to serve the first generation of automobile commuters. No one has documented these buildings, and they are often remade at the expense of their details or demolished altogether. Several that I remember seeing in the 1990s when I first moved in the 1990s are now gone. The ones I know best are on Westcott Street since I pass them most days. At the southeast corner of Westcott St. and Harvard Pl. is the popular Mom's Diner, which occupies a corner commercial building that has long been a place for local gathering and dining. The names of the establishments have changed, but the popularity of breakfast or lunch with neighbors has not. 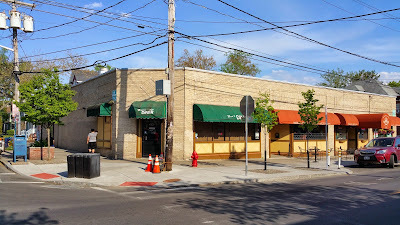 In the 1930s and 40s this was Whittig's Ice Cream Store, then it became the Westcott Bakery & Ice Cream Store, Chatterbox Cafe, and later the Common Grounds. 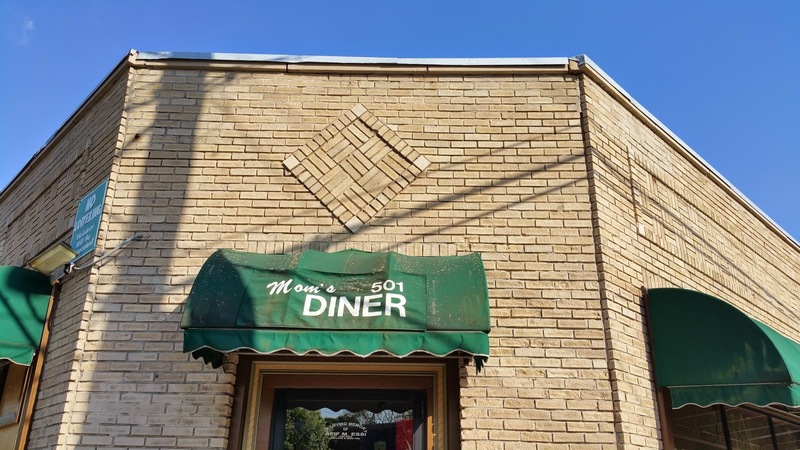 In recent years Mom's Diner has served up popular diner food, and the Diner is a popular morning meeting place for Westcott regulars young and old. Architecturally, the simple box-like building stands out with its simple and inexpensive aesthetic of flat brick walls enlivened with geometric patterns. 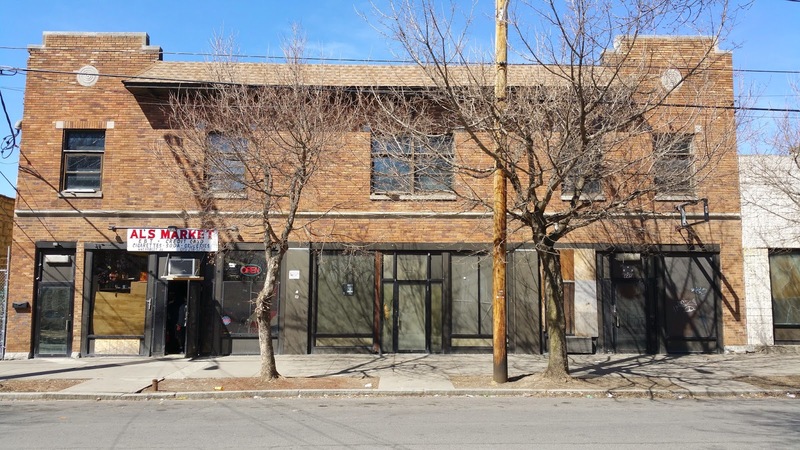 Across Westcott Street, Asahi Restaurant (#508) and Beer Belly Deli (#510) now occupy space built in the mid-1920s for comemrcial occupants, probably first a plumber and a building contractor. The decoration here is more serious - with fluted applied pilasters, a narrow deco-design frieze and a guarding eagle atop one of the pilasters where the building ends. Next door to the south, filling the in-between space until the Westcott Theater at number #524, is a now much-altered commercial building that originally housed, at least from 1928, the local A & P Grocery Store and the much later the Big M. The top part of the Discount Deco wall and a series of applied pilasters survive, but the windows were altered in the 1990s when the grocery closed and the space was divided. 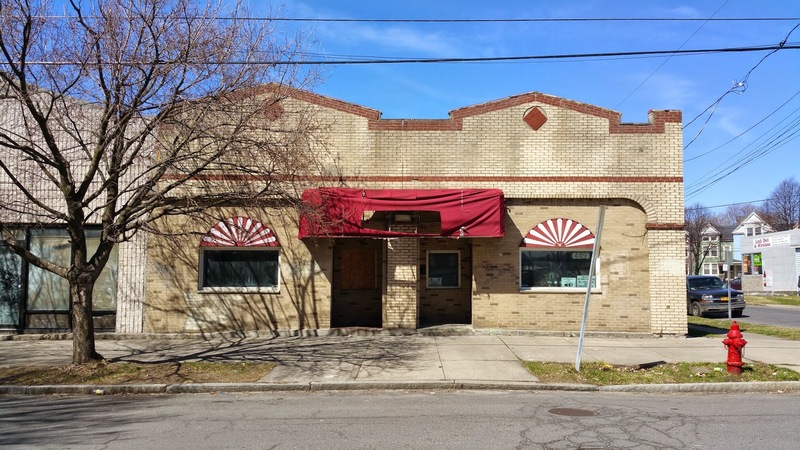 Also on the Eastside are few related 1920s chimerical buildings on East Genesee Street. The Community Folk Art Center is a good example, and two doors up Rothschild's Home Healthcare Center also is in a similar building, but the Deco details has been entirely covered over. The north side of the 400 Block of Hawley Avenue, on a block just outside the Hawley-Green National Register Historic District has four contiguous buildings of the type, though the original face on one has been either covered over or entirely replaced. Here is another example from the Westside, at the corner of Delaware and Grace Streets, across from the former Delaware Avenue Baptist church. Who knows how long this charming little abandoned building will last? Syracuse, NY. Former commercial building at corner of Delaware and Grace Streets. Photo: Samuel D. Gruber 2014. These are just a few surviving examples of what was once a familiar building type. But I'm keeping my eyes open and camera ready to find some more. Are there any in your CNY neighborhood? Among its many public monuments and art, Syracuse boasts a substantial collection of art by women sculptors. These include the Hamilton White Memorial at Fayette Park and the Kirkpatrick Monument (LeMoyne Fountain) by Gail Sherman Corbett, the Elemental Man by Malvina Hoffman and the bronze Saltine Warrior statue by Luise Kaish at Syracuse University, and the high relief sculpture of the Jerry Rescue Monument at Clinton Square by Sharon BuMann. There is also an abstract work by Penny Kaplan outside the Everson Museum, and women ceramicists have created murals in the Westcott area. Perhaps the most famous work by a woman sculptor in Syracuse,The Hiker, located at the south side of Billings Park, goes little mentioned. I venture that today most people who even know the name of the sculptor are not even aware that T. A. Kitson, was a woman. Yet Theo Alice Ruggles Kitson (1871-1932), was a leading artist of her time, and possibly the foremost American woman sculptor of her generation. She made many public monuments throughout the country and at least fifty casts of The Hiker, her best known work, are installed as memorials across the country. In 1895, Ruggles Kitson was the first woman to be admitted to the National Sculpture Society. In 1888, at age 17, she won honorable mention at the Salon des Artistes Francais (the youngest woman ever to receive the honor). She was celebrated when she returned to the United States and as a (minor) celebrity asked to comment on everything from art to fashions. When the Kitsons separated in 1909 (her husband had been her teacher and partner), Alice moved to Farmington, where she maintained a studio until her 1932 death in Boston, Massachusetts. The Syracuse Hiker at the south end of Syracuse's Billings Park in front of the former Central High School. It represents a Spanish American War soldier and commemorates those who died in that war, the Philippine-American War and the Boxer Rebellion. The statue reminds us of time, much like today, when American forces seemed to be engaged in an unending series of conflicts far from home. Though these were the first wars of American empire, The Hiker represents free-spirited and even carefree individualism rather than the increasingly professionalized militarism of the era. A handsome young soldier - ready for a jungle trek - steps confidently forward. Ruggles Kitson was appreciated as a woman sculptor who could make manly men. The first version was installed at the university of Minnesota in 1906. 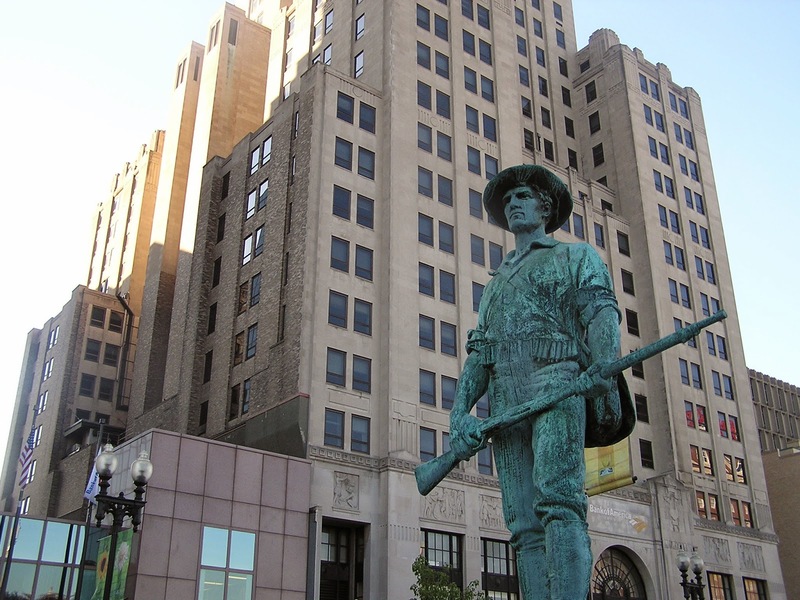 The bronze cast in Syracuse was dedicated on Memorial Day, 1924. In stanllatuion postdates the inauguration at the north end of the park of a stone monument dedicated July 15, 1920, known as the Rock of the Marne Monument, engraved with names of some of the local dead of World War I, atop of which stands the figure of an infantryman by sculptor Ronald Hinden Perry. . The Syracuse Hiker was one of the first placements of the iconic statue, which proliferated around the country after 1921 when the Gorham Manufacturing Company, located in Providence, Rhode Island, bought the rights to the statue, and over the next 44 years cast at least 50 Hiker statues. The earliest installations of The Hiker were mostly in the northeastern United States, often complementing Civil War Memorials. Post-World War II statues were installed mostly in the South and West. The Syracuse statue was recently restored and cleaned. Interestingly, because of the wide distribution of the statues, they have been used to study air pollution over the last century since their original state is known, and in case so is the date of their installation. Thus conservators and meteorologists can compare deterioration and analysis the effect of acid rain and other pollutants in specific places and over measurable time. Billings Park is a small open space at South Salina, South Warren and East Adams Streets; about a third of acre in size. It was once a more prominent space in the city, when central High School was open and when the downtown was more knit to the south of the city along South Salina Street. Today, there is little residential use of the area and there are more parking lots and garages than active commercials centers. The space was formerly Warren Park, named like Warren Street in honor of American Revolutionary War General Joseph Warren. Roger Billings had his carriage factory on the north side of Adams Street across from the park from 1841 to 1859;(where the recently constructed bus terminal is now) and he helped improve the park with help from fellow citizens Richard W. Jones, George Ostrander and George Herman. The provided new landscaping, walkways and a central fountain, and the park was dedicated by Mayor William Stewart, August 24, 1867. Charlotte Streifer Rubinstein, 1990. American Women Sculptors: A History of Women Working in Three Dimensions (Boston: G.K. Hall & Co, 1990), pp 102-105.